Great news! We now offer a Free Shuttle Bus Service twice a day. This can help you to easily get from the Hotels to Big Blue Surf Centers, and back! Check out our promo video to get a feel for the Big Blue Surf Center. FBC PRO camp 2017, Book Now ! The 2017 FBC Fanatic Windsurfing Camp dates with Tom Brendt & Yoli De Brendt at our FBC centers are ONLINE NOW and ready to book. Choose FBC KOS. Whatever your level, Tom & Yoli will change the way you windsurf and the way you feel about your windsurfing in just one week of intense yet fun professional training. These camps fill up fast so book now to avoid disappointment! 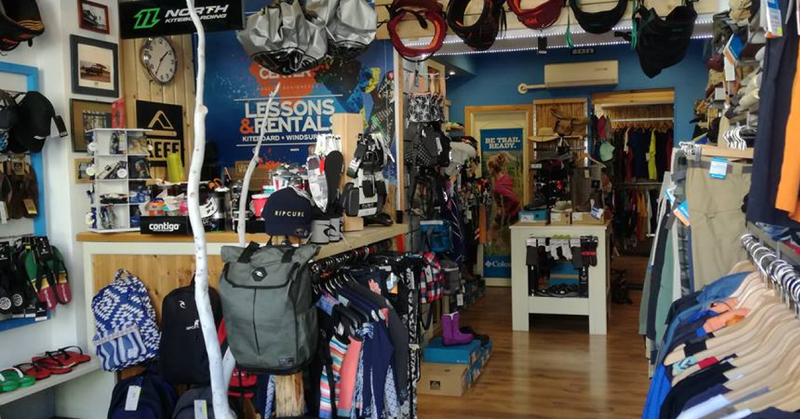 We have recently opened the Big Blue Surf Shop in Kos town, located in the popular shopping area just a short walk from the main square. We stock ION, Scoop, Fanatic and North sports clothes including boardies, wetsuits and lycras. We also stock windsurfing accessories such as ION sunglasses, harnesses, gloves and beach shoes, and in the winter we stock Columbia sportswear.